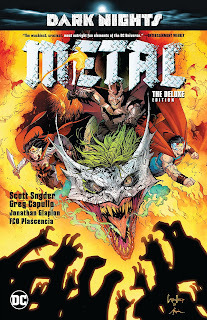 Dark Nights: Metal is a rollicking good superhero story, demonstrating Scott Snyder and company's abiding love for the DC Universe's characters and history. In certain respects I think its grandiose cheekiness undercuts the story's suspense, but it's hard to argue with the breadth of characters that Snyder gets on the page and the deference he pays to both DC's Big Three characters and the core members of the Justice League. I appreciate the extent to which Metal stands on its own, but for me the most heartening aspects of this book were the ways in which it nods to the contemporaneous present of the DC Universe, and its role as a raucous prelude to Snyder's new Justice League title. Though again rather raucous, expansive, and enjoyable, Metal felt smaller to me than I'd expected. Consider for instance that Batman is entirely absent the third chapter and in various stages of imprisonment in a dreamscape through the fourth and fifth; this is not solely Batman's story but neither is it not Batman's story, and even Superman's arc here is to be captured in the third issue and then have to fight his way out over the rest. In comparison to Infinite Crisis, whose boots-on-the-ground story involved a lot of mid-action twists and turns, Metal basically sets its heroes on their quests by the third issue and then just lets those quests play out. The events of the story taking place on the Earth of the fantastical Dark Multiverse lessened the suspense considerably. I don't by any means intend to suggest that Metal does not have heart nor message (it does, clearly in line with Snyder's aspirational Batman stories past), but for me the fact that the pitched battles weren't collapsing recognizable Metropolis buildings and that few heroes even demonstrated significant injury made the story feel safe. I was many times surprised, but never terribly worried; I might perhaps applaud Metal for its lack of gratuitous death (except for poor Nightmaster), but again as compared to Infinite Crisis, at least in Infinite Crisis I felt some sense of the stakes. Like a number of titles in the Rebirth era, Metal is also hampered by DC Comics' uncertain continuity. The reference to Aquaman's harpoon hand and the editorial directive to "see the '90s" is funny to be sure, but it's hard to square that Aquaman ever had a "harpoon hand phase" in today's continuity with the fact that no one recognizes Red Tornado. Further, apparently no one knows Kendra Saunders even though she "knows all of you," but two issues later Wonder Woman refers to the heroes as Kendra's "friends" and an issue after that uses the name "Hawkgirl." That could be a moving moment, but the inherent confusion pulls me out of the book. Equally, not to take away from Metal's come-what-may aesthetic, but the in medias res appearances of both Martian Manhunter and Joker felt flat to me because nothing about them is foreshadowed or connects to other parts of the story. We're meant to care just because these instances happen, not through our investment in the story, and that seems to me the weaker way to go. Those nitpicks aside, however, if we view Metal as what I feel it's turned out to be -- less of an "event" (it is tiny, issue-wise, by that measure) and more of a prelude to Snyder's Justice League -- it is successful and auspicious in leaps and bounds. The chaff of those angst-ridden Infinite Crisis days is totally melted away here as Snyder has Superman, trying to reason with Batman, demand, "It's me. We're brothers." Much in line with Snyder's Justice League partner James Tynion's Rebirth Detective Comics, these are heroes who know they're heroes, who act like heroes, who respect their long history of working together just as much as the audience does, and bless you Scott Snyder for letting them show affection for one another (even as Superman is shaking Batman and Batman is actually Clayface). Metal also offers a parallel storyline for Wonder Woman as coordinator (and chief warrior) of the League's other forces. Not for the first time, Diana's uncomplicated leadership seems the best the League has. And though Green Lantern and Aquaman's respective side journeys don't amount to much, the odd teamings of heroes whets my appetite for No Justice. Aquaman with Deathstroke, especially, offers a lot of laughs. As well, as a continuity wonk I was wholly delighted by the book's final pages, which tease the storylines one could find almost immediately in Wonder Woman, Flash, Green Lantern, and Aquaman's books (and which, with the collection release, one can now immediately find in recent back issues). This is the kind of thing I think most events don't do because it doesn't age well, referencing instead perhaps some miniseries continuance of the event itself, but Metal's act is uniquely generous, an act of gentle marketing almost unheard of in comics. And that Snyder singles out the historic Leaguers, reaffirming them as cornerstones of the DC Universe, is also nice. In this way too, Snyder and Metal affirm in act what they preach in story, this message of "we're all in this together," and I don't think anyone doubts that the reported magnanimity of the new Justice League line is sincerely felt by its creators. Among my favorite parts of Dark Nights: Metal was the final seven-page confrontation between Batman, the Batman Who Laughs, and the Joker. Maybe madcap fights across an alt-Earth wasteland just aren't for me, but I felt far more comforted by Scott Snyder, Greg Capullo, and Batman in a dark cave facing off against a villain, a sequence surely meant to evoke the climaxes of Snyder and Capullo's seminal Death of the Family and Endgame. Metal is a lot of things, many of them good and many of them portending good things for the future, but among them was a chance to have the Snyder/Capullo band back together, and this sequence delivered that in spades. What issues are collected in this? Solicits said just Metal issues 1 to 6 by Snyder had been on twitter saying a while back that the Batman Lost and Wild Hunt one-shots would be included? This deluxe should only include Metal 1-6 the core issues, The Wild Hunt should be included in Dark Nights Rising, which will include all the evil Batmen one-shots, and Batman Lost/Hawkman Found will be included in the resistance trade that'll have all the crossover issues with other titles. That's a shame. I remember Snyder tweeting that the solicit for this was wrong but I guess not. May wait for the inevitable omnibus edition then. I was pleasantly surprised with Metal, and was so happy with it that I ended up buying nearly every single issue connecting to the event. I'll be interested in what you think about the evil Batmen one shots. I personally feel they are more interesting and better written than the core event, my favorite issue in this whole event is Batman: Murder Machine. Love that issue. As to this deluxe I think I'm going to wait for the omnibus and hope it's in the correct reading order. I feel confident like Infinite Crisis and Final Crisis, we'll see many varied collected editions of this for years to come. I think Orlando's The Unexpected is supposed to tackle some of it, same with Sideways? I seem to be alone in my opinion of this series, but I thought it was a huge mess. Snyder trying to channel the most infuriating parts of Morrison's writing wherein absolutely everything is thrown at the wall to see what sticks. Maybe I'm getting old but the whole thing seemed nonsensical to me. I long for Snyder's most straightforward stories (e.g., The Black Mirror, Court of Owls, Death of the Family).